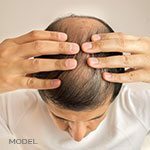 MilfordMD Cosmetic Dermatology Surgery & Laser Center, Milford, Penn., Announces Public is Invited to Upcoming “Latest Techniques in Facial Rejuvenation” Seminar. Just in time for the holidays, MilfordMD Cosmetic Dermatology Surgery & Laser Center is hosting a special presentation: “Latest Techniques in Facial Rejuvenation.” The public is invited to the seminar on Thursday, November 3, from 5 pm to 7 pm. Just in time for the holidays, MilfordMD Cosmetic Dermatology Surgery & Laser Center, Milford, Penn., has announced that it will host an educational seminar for the public, the “Latest Techniques in Facial Rejuvenation.” The Thursday, November 3, 2016, two-hour special event starts at 5 pm. The special facial rejuvenation seminar is free to those that RSVP and includes a free facial rejuvenation consultation (valued at $150) for attendees who schedule facial procedures before December 31, 2016. Attendees will go home with gift certificates, which can be used toward facial rejuvenation treatments at MilfordMD. And the event includes a skin care raffle, as well as a gift for seminar guests. Among the topics: optimal use of facial fillers, including Restylane and the semi-permanent filler Sculptra; skin smoothing possibilities with the neuromodulator Dysport; ThermiSmooth, for lines around the eyes and mouth; ThermiRase, to rejuvenate pesky neck cords; and a menu of treatment options for the neck, including ThermiTight, micro-invasive neck tightening; Ultherapy (which can also rejuvenate the brow and mouth area), Fraxel, Thermage and CoolSculpting. For example, according to Dr. Buckley, people are familiar with how neuromodulators, like Botox and Dysport, work to diminish muscle contraction and, therefore, soften facial expression lines. But few realize there’s a toxin-free approach for disabling nerves that cause neck cords to become more visible, called ThermiRase. Other radiofrequency devices in the Thermi family include ThermiTight, with which Dr. Buckley says he has been having outstanding results in neck skin tightening (and other body areas), as well as ThermiSmooth, which delivers precise heating to the skin’s surface to gently target loose skin around the eyes and mouth. Use of radiofrequency to heat tissue is one approach to facial rejuvenation. Fat freezing is another. Ultherapy, on the other hand, uses the power of highly focused ultrasound (HIFU) technology to noninvasively lift the brows, neck and under the chin. The device is FDA cleared for those indications, as well as for improving décolletage lines and wrinkles. Thermage, a non-invasive, radiofrequency treatment for wrinkles, can deliver rejuvenating results in a single treatment, with minimal downtime. 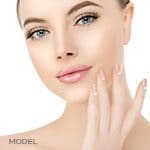 Dr. Buckley also uses fractionated laser therapy, with the Fraxel Thulium, re:store and re:pair, to rejuvenate the face, as a noninvasive alternative to the facelift. Seating is very limited for the November 3 special event, “Latest Techniques in Facial Rejuvenation,” and RSVPs are required. To reserve your seat, call MilfordMD Cosmetic Dermatology Surgery & Laser Center at 570-296-4000. 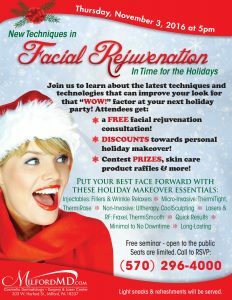 What’s New in Facial Rejuvenation, Just in Time for the Holidays!